My ultimate everyday indulgence is my daily bath. It de-stresses me like nothing else. Yes, even more than a spa does! My very reason why I had a bath tub installed when we finally were able to afford to have our very own house built. But even before that, I have made use of make shift tubs and lavished my bath water with bubble bath, dead sea salt or spa milk salt. There’s just nothing like being enveloped in conducive aromas as I relax the stress of the day away. 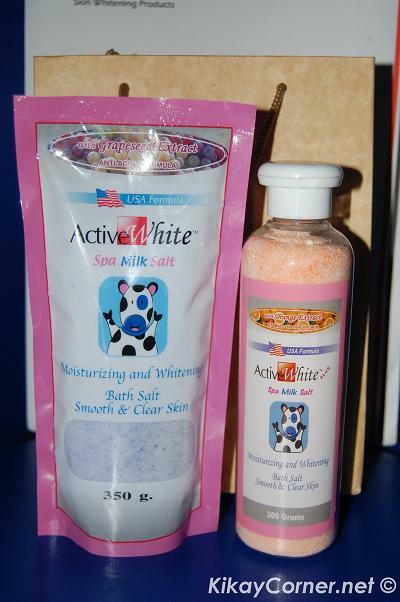 As for the bath salts, Active White Spa Milk Salt is one of the brands that I have been using for a while now. What initially attracted me to it was the inviting scent of orange. Active White Spa Milk Salt allows for more than just de-stressing. It is also designed to moisturize, whiten and nourish the skin. Active White Spa Milk Salt has seven yummy variants: Milk, Orange, Coffee, Avocado, Coconut, Strawberry and Grape- P69.75 for the 350g refill pouch and P99.75 for the 300g bottle. Available at SM department stores, Watson’s, Mercury Drug, Southstar drug and other leading outlets nationwide. Cool! I used to use this.